Massachusetts is a state full of cities and other natural things. Massachusetts' population is 6,117,520. Its capital city is Boston and its five largest cities in order are: Boston (over 500,000 people), Worcester, Cambridge, Salem, and Springfield. Massachusetts is located in the Northeastern U.S. and borders New Hampshire and Vermont to the North, New York to the West, and Connecticut and Rhode Island to the South. Massachusetts' physical location gives it great climate. It has spring, summer, a nice fall, and a mild winter near the coast but very cold winters inland. The Bay State's Coastal Plain covers all of the arm that stretches out from Massachusetts. The Seaboard Lowland covers the entire Eastern part of Massachusetts except for the arm. Massachusetts has a coastline of 1,900 miles. This is more than California's coastline. The New England Upland is located in central Massachusetts and has hills, streams, and rivers. Finally, the Berkshire Hills is located in Western Massachusetts, has rivers, and is home to Mount Greylock, the highest point in the state at 3,491 feet in elevation. The mountain ranges in Massachusetts are the Taconic Mountains, Berkshire Hills, and Hoosac Range. Massachusetts has many hills, thick forests, rocky coastlines, sandy beaches, sand dunes, and rich soil. In addition, the largest rivers in the state are the Connecticut River, Marrimade River, and Nashua River. Some ponds and lakes are Walden Pond and Lake Webster. Lake Webster is also known as Lake Chargoggagoggmanchaugagoggchaubunagungmaug, which means, "You fish your side of the lake. I fish my side. Nobody fishes in the middle." Martha's Vineyard and Nantucket Island are islands off the Southern coast of Massachusetts. Both of these islands have beaches and old villages. 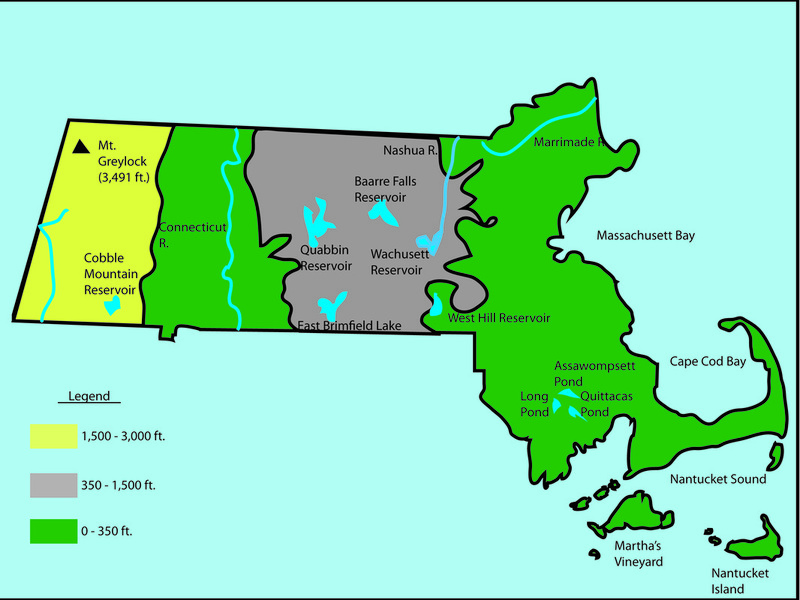 To see some of the geographical features of Massachusetts, see the map below. Massachusetts is also home to animals. It has foxes, muskrats, porcupines, rabbits, chipmunks, squirrels, raccoons skunks, and meadow mice. Some birds that live there are cardinals and bald eagles, while seagulls are abundant on the coast. Some examples of Massachusetts fish are cod, trout, and white/yellow perch. There are also some endangered species in Massachusetts. These include the reset tern, piping plover, and right whale. Right whales are no longer abundant because they were hunted for their meat and other body parts. Since they were abundant on the shores and were slow, they were seen as the "right" whale to hunt. Now they are no longer hunted and can swim alongside ships.